The former Bitcoin exchange Mt. Gox filed for Chapter 15 in the United States during this Sunday (9). In other words, the Japan-based company has filed for the chapter of the bankruptcy code created to facilitate insolvency cases with parties located in more than one country. The decision happens almost two weeks after the exchange, which is based in Tokyo, filed for bankruptcy in Japan. The news was announced on February 28th by the company’s CEO, Mark Karpeles, during a press conference. In the meantime, Karpeles’ blog was allegedly hacked. The attackers ended up using the platform to post what they say is a balance sheet of the exchange’s accounts. The file, with more than 700 megabytes, reportedly depicts Mt. 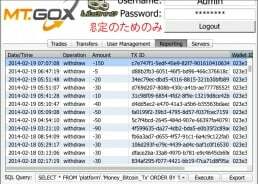 Gox operational information and transaction data. One of the sheets included in the document even hints that the exchange could still have a balance of over 951,116 BTC, according to Coindesk. However, among the genuine Mt. Gox data, the file also included trojans able to hack the users’ Bitcoin wallets and steal cryptocurrency. The visitors who clicked on the links should now transfer their coins to another wallet, as soon as possible. The blog ‘Magical Tux’ that once belonged to the executive director of Mt. Gox is now inactive, but the controversy continues very much alive.